See the scary “Bride of Frankenstein” and funny “Young Frankenstein” movies with background music by the Chicago Symphony Orchestra at Symphony Center, 220 S. Michigan Ave. Oct. 26 For tickets and other information call (312) 294-3000 and visit CSO. Or see Remy Bumppo’s scary production of Mary Shelly’s “Frankenstein,” Oct. 28-30 (Oct. 27, 27 and 31 are sold out) at Theater Wit, 1229 W. Belmont Ave. For tickets and other information call (773) 975.8150 or visit RemyBumppo. 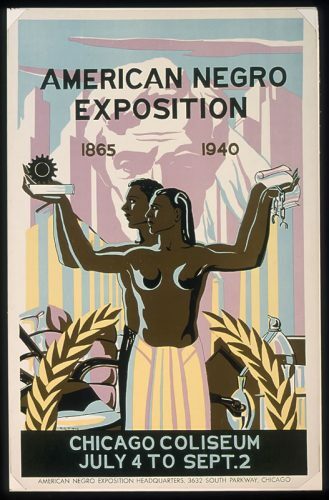 “2019 African American Designers in Chicago: Art, Commerce and the Politics of Race” opens Oct. 27, at the Chicago Cultural Center. The exhibit runs the advertising gamut from illustration, cartoons, and graphic design to architectural signage, product and exhibit design and sign painting. Located up on the fourth floor and continuing through Mar. 3, 2019, the exhibiti s part of the current Art Design Chicago events that explore the city’s art and design history. Art Design Chicago is partially funded by the Terra Foundation for American Art and The Richard H. Driehaus Foundation. The Chicago Cultural Center is at 78 E. Washington St. For more information visit City of Chicago. The Oriental Institute, an internationally known center for study of ancient Middle Eastern civilizations, is holding Mummy Tours every half hour Oct 27 from 4 to 7 p.m. Space is limited so registration is needed. Admission is free but adults are asked for a $5 donation. The event also includes Mummy Simulations. 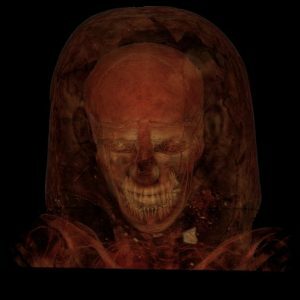 Tickets to the Mummy Simulations (also every half hour) are free to adults, $3 per child, and can be purchased at the event. For registration and other information visit Oriental Institute. .For questions call the OI Public Education Office at (773) 702-9507. The Oriental Institute is at 1155 E. 58th St. on the University of Chicago campus..
Maxwell Street Market is celebrating the Day of the Dead Oct. 28 from 10:30 a.m. to-2 p.m. with the dedication of a surrealist Mexican mural, pumpkin carving. An ofrenda (altar) workshop, other arts and crafts and live music. The Maxwell Street Market is at 800 S. Des Plaines Ave. For event times and more information visit Maxwell Street Market. Certainly, the Field Museum is known for its T Rex and dinosaurs in its “Evolving Planet” exhibition and for its native American exhibits including the popular Pawnee Earth Lodge. But another favorite permanent exhibition is “Inside Ancient Egypt” where visitors descend down into a tomb and see painted mummy coffins. 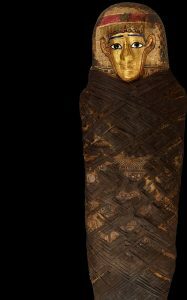 Segment of photo by John Weinstein of a the Gilded Lady coffin from between 30 BC and 646 A, Egypt. Now, the contents of those coffins and others can be revealed because of current technology. It also has sculptures and 3D images that show what a mummified person likely looked like when alive. 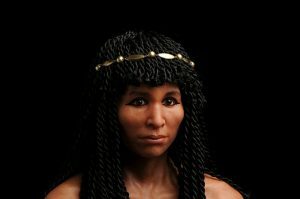 For instance, there is a mummy of an Egyptian woman in the exhibit from 1,500 years ago that scientists say died when in her 40s, had curly hair and a slight overbite. Just as fascinating are interactive touch-table stations where visitors see artifacts and mummies the way scientists do. “This exhibition allows visitors to see how we use modern technologies to learn about the lives of ancient peoples and cultures,” said Curator Bill Parkinson. “Before, you would have to unwrap the mummy, or even cut it open, to learn more about it. Now we can use non-destructive methods to learn so much more about the past,” Parkinson said. Also featured, is Peruvian mummification done by the Andean cultures earlier than in Egypt. 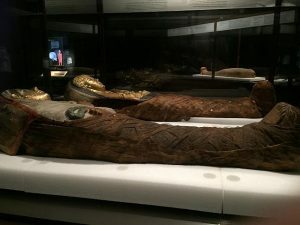 “Mummies,” up now through April 21, was developed as a traveling exhibit by the Field Museum but has just returned home. “Because the exhibition is back at its home base, we’ll be able to include some cool artifacts that were too fragile to send out on the road,” said Exhibitions Project Manager Janet Hong. Thus, a couple of two-and-a-half-foot tall Peruvian beer jars, once shown at Chicago’s 1893 World’s Fair, were added to the exhibit. Mummies is a ticketed exhibition. A Good way to see it and such exhibits available through General Admission such as “Inside Ancient Egypt” is with a Discovery or All-Access pass. The Field Museum is at 1400 S. Lake Shore Drive, Chicago. Hours: Daily 9 .am. to 5 p.m. except Christmas. For tickets and more information call (312) 922-9410 and visit Field Museum.